Durante degli Alighieri, better known as Dante, (c. June 1, 1265 – September 14, 1321) was an Italian and Florentine poet. His greatest work, the epic poem The Divine Comedy, is considered the greatest literary statement produced in medieval Europe. Much like Geoffrey Chaucer in England and Alexander Pushkin in Russia, Dante is credited not only with creating a magnificent poetry; he is also considered to be the father of the modern Italian language itself. This may be somewhat of an exaggeration, for while the very language of The Divine Comedy would become so widespread that it would form the basis from which the Italian language would emerge, Dante was by no means alone in writing luminous works in this formative period of Italian literature. He was a contemporary (and in some cases, a friend) of such luminaries as Guido Cavalcanti and Petrarch. Dante is sometimes considered to be the most important poet of the Renaissance. Some have even gone so far as to suggest that the Renaissance begins with Dante; he made the first steps out of the ancient world and into the modern world. Often ranked with Homer and Virgil as one of the great epic poets, Dante is certainly the most modern. While the epic poets of ancient times tended to celebrate the greatness and heroism of their respective nations (for Homer, Greece; for Virgil, Rome) Dante's objective in his epic is decidedly different: to explore Hell, Purgatory, and Heaven and, in so doing, reconcile Europe's Hellenic past with its Christian present. Dante's epic has no epic battles, nor any towering heroes. Its protagonist is Dante himself, a plain and (by his own admission) somewhat reserved Florentine. Its action consists, primarily, of Dante's encounters and conversations with the dead. In so doing, Dante establishes a dialogue with the past in a way never before realized, and leads the way into a future that would become the Renaissance—literally, the rebirth—of European culture, a recapturing and "baptizing" of its Hellenic past. Dante was born in 1265 and by his own account, placed his birthday between May 18th and June 17th. As an infant, Dante was christened “Durante” in Florence's Battistero di San Giovanni or Baptistery in Florence. He was born into the prominent Alighieri family of Florence, whose loyalties were to the Guelfs, a political alliance that supported the Papacy, in opposition to the Ghibellines, who were backed by the Holy Roman Emperor. After the defeat of the Ghibellines by the Guelfs in 1289, the Guelfs themselves were divided into White Guelfs, who were wary of Papal influence, and Black Guelfs, who continued to support the Papacy. In the Divine Comedy, Dante (a White Guelf) pretended that his family descended from the ancient Romans (Inferno, XV, 76), but the earliest relative he can mention by name is Cacciaguida degli Elisei (Paradiso, XV, 135), from no earlier than the year 1100. His father, Alighiero de Bellincione, was a White Guelf, but suffered no reprisals after the Ghibellines won the Battle of Montaperti, and this safety reveals a certain personal or family prestige. Dante's mother was Donna Bella degli Abati. "Bella" stands for Gabriella, but also means "beautiful," while Abati (the name of a powerful family) means "abbot." She died when Dante was five or six years old, and Alighiero soon married Lapa di Chiarissimo Cialuffi. It is uncertain whether he really married her, as widowers had social limitations in these matters. However she definitely bore two children, Dante's brother Francesco and sister Tana (Gaetana). When Dante was 12, he was promised in marriage to Gemma di Manetto Donati, daughter of Messer Manetto Donati. Contracting marriages at this early age was quite common, and was an important ceremony, requiring formal deeds signed before a notary. Dante had four children with Gemma; Jacopo, Pietro, Gabrielle, and Antonia Alighieri. Not much is known about Dante's education. It is believed he studied at home. He studied Tuscan poetry, at a time when the Sicilian School (Scuola poetica siciliana), a cultural group from Sicily, was becoming known in Tuscany. His interests brought him to discover Provençal minstrels and poets, and Latin culture with a particular devotion to Virgil. It should be underlined that during the Secoli Bui or Dark Ages, Italy had become a mosaic of small states. Sicily was culturally and politically as far from Tuscany as was Provence. The regions did not share a language, culture, or easy communications. Nevertheless, Dante was keenly aware of intellectual and international interests. At age 18, he met Guido Cavalcanti, Lapo Gianni, Cino da Pistoia, and soon after Brunetto Latini; together they became the leaders of Dolce Stil Nuovo (“The Sweet New Style”), which became one of the leading literary movements of medieval Italy. Brunetto later received a special mention in The Divine Comedy (Inferno, XV, 82), for his contributions to Dante's development. When he was but nine years old, he met Beatrice Portinari, the daughter of Folco Portinari, with whom he fell in love "at first sight," and apparently without even having spoken to her. He saw her frequently, often exchanging greetings in the street, but they never became involved romantically. It is hard to decipher of what this love consisted, but something extremely important for Italian culture was taking place. Dante, along with the rest of the Stil Nuevo poets, would lead the writers of the Renaissance to discover the themes of romantic Love (Amore), which had never been so emphasized before. His love for Beatrice would become Dante's reason for poetry and for living, in a somewhat different fashion Petrarch would show for his Laura. When Beatrice died in 1290, Dante, then 25, sought a refuge in Latin literature. From the Convivio it is known that he read Boethius's De consolatione philosophiae and Cicero's De amicitia. He then dedicated himself to philosophical studies at religious schools like the Dominican Santa Maria Novella. He took part in the disputes between the two principal mendicant orders, the Franciscans and Dominicans. The Franciscans adhered to a mysterical doctrine of the mystics and of San Bonaventura, the latter Saint Thomas Aquinas. Dante would use Beatrice to criticize his "excessive" passion for philosophy in the second book of The Divine Comedy, Purgatorio. Dante, like many Florentines of his day, became embroiled in the conflict between the Guelphs and Ghibellines. He fought in the battle of Campaldino (June 11, 1289), with Florentine Guelf knights against Arezzo Ghibellines. In 1294 he was among those knights who escorted Carlo Martello d'Anjou (son of Charles of Anjou) while he was in Florence. To further his political career, he became a doctor and a pharmacist; he did not intend to take up those professions. However, a law issued in 1295 required that nobles who wanted to assume public office had to be enrolled in one of the merchant guilds. Dante quickly obtained admission to the apothecaries' guild. The profession he chose was not entirely inapt, since at the time books were sold from apothecaries' shops. As a politician, he accomplished little of relevance, but he held various offices over a number of years in a city undergoing some political agitation. Pope Boniface VIII was planning a military occupation of Florence, in 1301. The Pope appointed Charles de Valois, brother of King Philip IV of France, as peacemaker for Tuscany. At the time, Florence's city government was expecting a visit from him. They had treated the Pope's ambassadors poorly a few weeks earlier. Members of the city government openly feared Charles de Valois might have "unofficial" orders, so the council sent a pre-emptive delegation to Rome, in order to ascertain the Pope's intentions. Dante was made the chief of this delegation. Upon the delegation's arrival, the pope summarily dismissed the representatives and asked Dante alone to remain with him in Rome. At the same time on November 1, 1301, Charles de Valois was entering Florence with Black Guelfs. For the next six days the Black Guelfs destroyed everything and killed most of their enemies. A new government was installed in Florence composed of Black Guelfs, with Cante dei Gabrielli di Gubbio appointed as mayor of Florence. Dante was still in Rome at the pope's request. He was therefore considered a deserter by the Florentines. As a result, Dante was exiled from his native city and ordered to pay a substantial sum to atone for his absence from the battle. Separated from his wealth, he could not pay his fine. Dante was condemned to perpetual exile with a price on his head. Had Florentine soldiers caught him, he would have been executed. The poet took part in several attempts by the White Guelfs to regain Florence, but these all failed due mainly to treachery. Dante was bitter at the treatment he had received in Rome at the hands of his enemies. He also grew disgusted with the infighting and ineffectiveness of his erstwhile allies, and vowed to become a party of one. At this point he began sketching the foundations for the Divine Comedy as a work in 100 cantos divided into three books of thirty-three cantos each, with a single introductory canto. Divesting himself of any allegiance, Dante went to Verona as a guest of Bartolomeo Della Scala. He then moved to Sarzana, and afterwards he is supposed to have lived for some time in Lucca with Madame Gentucca, who made his stay comfortable. She was later gratefully mentioned in Purgatorio (XXIV, 37). Some speculative sources have placed him in Paris, between 1308 and 1310. Other sources, less trustworthy, place him in Oxford in Great Britan. In 1310 the German King Henry VII of Luxembourg invaded Italy. Dante saw in him the chance for revenge, so he wrote to Henry VII and to other Italian princes, several public letters attempting to incite them to destroy the Black Guelfs. Mixing religious and private concerns, he suggested several particular targets that coincided with his personal enemies. In 1312, Henry VII assaulted Florence and defeated the Black Guelfs, but there is no evidence that Dante was involved. It is believed by some that he refused to participate in the assault on his city. Other suggestions include that his name had become unpleasant for White Guelfs also and that any trace of his passage had carefully been removed. In 1313 Henry VII died, and with him any residual hope for Dante to see Florence again. He returned to Verona, where a patron allowed him to live in security and, evidently, a fair degree of prosperity. Coincidentally, this patron would be, in Dante's poem, admitted to Paradise (Paradiso XVII, 76). In 1315, Florence was forced militarily to grant an amnesty to all of its people in exile. Dante was on the list of citizens to be pardoned, but Florence required that in addition to paying a sum of money, these citizens agree to be treated as public offenders and recant in a religious ceremony. Dante refused this formula, calling it "outrageous" and remained in exile. lo scendere e 'l salir per l'altrui scale . . .
ascending and descending others' stairs . . ."
del mio battesmo prenderò 'l cappello . . .
Dante never returned to Florence. Prince Guido Novello da Polenta invited him to Ravenna in 1318. He finished his epic poem there, dying in 1321 at the age of 56 while on the way back to Ravenna from a diplomatic mission in Venice, perhaps of malaria. Dante was buried in the Church of San Pier Maggiore (later called San Francesco). Bernardo Bembo, praetor of Venice, in 1483 took care of Dante's remains, organizing and re-interring his body in a better tomb. Eventually, Florence came to regret Dante's exile. In 1829, a tomb was built for him in Florence in the basilica of Santa Croce. That tomb has been empty ever since, as Dante's body remains still in its tomb in Ravenna, far from the land he loved so dearly, but which never allowed his return. La Vita Nuova contains 42 brief chapters with commentaries on 25 sonnets, one ballata, and four canzoni; one canzone is left unfinished, interrupted by the death of Beatrice Portinari, Dante's life-long love to whom all of the poems in the volume are dedicated. Dante's commentaries explicate each poem, placing it within the context of his life. They present a frame story, which is not apparent within the sonnets themselves. The frame story is simple enough: it recounts the time from Dante's first sight of Beatrice when he was nine years old, and she was eight, all the way to Dante's mourning her death, and his determination to write of her "that which has never been written of any woman." Each separate section of commentary further refines the poet's concept of romantic love as the initial step in a spiritual development that results in the capacity for divine love. Dante's unusual approach to his piece—drawing upon personal events and experience, addressing the readers, and writing in the vernacular rather than Latin—marked a turning point in European poetry, encouraging many writers to abandon highly stylized forms of writing for a simpler one. 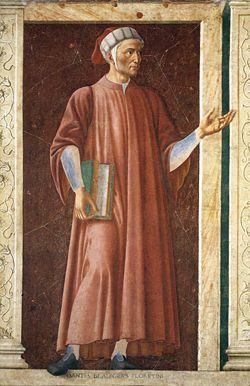 Dante wrote the work at the suggestion of his friend, the poet Guido Cavalcanti. Each chapter typically consists of three parts, the autobiographical narrative, the resulting lyric that arose from those circumstances, and an analysis of the subject matter of the lyric. Though the result is a landmark in the development of emotional autobiography, the most important advance since Saint Augustine's Confessions in the fifth century, like all medieval literature it is far removed from the modern autobiographical impulse. Moderns think that their own personalities, motivations, actions and acquaintances are interesting. None of that, however, was of concern to Dante. What was interesting to him, and his audience, were the emotions of noble love, how they develop, how they are expressed in verse, and how they reveal the permanent intellectual truths of the divinely created world, how, that is, love can confer blessing on the soul and bring it closer to the divine. Appropriately, therefore, the work does not contain any proper name, except that of Beatrice herself. Not even her surname is given, or any details that would assist readers to identify her among the many ladies of Florence: only the name "Beatrice,” because that was both her actual given name and her symbolic name as the conferrer of blessing. Dante does not name himself. He refers to Guido Cavalcanti only as "the first of my friends," to his own sister as "a young and noble lady ... who was related to me by the closest consanguinity," to Beatrice's brother similarly as one who "was so linked in consanguinity to the glorious lady that no-one was closer to her." The effect is that the reader cannot, as in a modern autobiography or novel, be distanced from the characters as one is distanced from one's own acquaintances. Instead, the reader is invited into the very emotional turmoil and lyric struggle of the unnamed author's own mind, and all the surrounding people in his story are seen in their relations to that mind. There have been a variety of interpretations of La Vita Nuova. Among them is that of Mark Musa, who claims that rather than a serious autobiographical exploration of Love, La Vita Nuova is "a cruel commentary on the youthful lover" that points out the "foolishness and shallowness of his protagonist, a self-centered and self-pitying youth." Regardless of whatever Dante's true purpose in writing it was, La Vita Nuova is essential for understanding the context of his other works; principally The Divine Comedy. The Divine Comedy describes Dante's journey through Hell (Inferno), Purgatory (Purgatorio), and Paradise (Paradiso), guided first by the Roman epic poet Virgil and then by his beloved Beatrice. While the vision of Hell, the Inferno, is vivid for modern readers, the theological nuances presented in the other books require a certain amount of patience and scholarship to understand. Purgatorio, the most lyrical and human of the three, also has the most poets in it; Paradiso, the most heavily theological, has the most beautiful and ecstatic mystic passages, in which Dante tries to describe what he confesses he is unable to convey. Dante wrote the Comedy in his regional dialect. By creating a poem of epic structure and philosophic purpose, he established that the Italian language was suitable for the highest sort of expression, and simultaneously established the Tuscan dialect as the standard for Italian. In French, Italian is nicknamed la langue de Dante. It often confuses readers that such a serious work would be called a "comedy." In Dante's time, all serious scholarly works were written in Latin (a tradition that would persist for many hundreds of years more, until the waning years of the Enlightenment), and works written in any other language were assumed to be comedic in nature. The Divine Comedy is notable not just for its content, although that in itself is revolutionary. Dante is the first major poet to write an epic in the Christian tradition, and in so doing he demonstrated the durability of Biblical figures (such as Heaven and Hell, Satan and God) for telling stories of great drama and intrigue. Moreover, he is one of the first poets, major or otherwise, to tell a story not of heroes and battles but of personal crisis and introspection. Dante's ideal guide through Purgatory and Heaven is his true love, Beatrice; and in many ways it was through Dante that the ideal of a true, romantic love would come to permeate Western culture. The rhyme scheme of the Divine Comedy (which is sadly difficult to reproduce in English without sounding forced) gives the reader a sense of onward movement—each terset introduces a new rhyme—while at the same time continuing with rhymes seen from the previous terset, creating a sense of gradual progress much like Dante's description of his gradual ascent through the worlds of the afterlife. Terza rima has become so closely associated with Dante that the mere use of it is often enough to indicate that a poet is alluding to Dante's works. Other works of Dante include Convivio ("The Banquet"), a collection of poems and interpretive commentary; Monarchia, which sets out Dante's ideas on global political organization; De vulgari eloquentia ("On the Eloquence of Vernacular"), on vernacular literature. Bonghi, Giuseppe. Glossario de Italiano Medioevale. Riccardo, Merlante. Dizionario della Divina Commedia. A dictionary of words used by Dante. Medieval Italian and Modern Italian. Gustarelli, Andrea. Dizionario Dantesco, per lo studio della Divina Commedia. Casa Editrice Malfasi, 1946. A dictionary of those words in The Divine Comedy whose meaning in Medieval Italian differs from that in Modern Italian. "Digital Dante" – A resource page dedicated to Dante and his works. Read Dante Alighieri's works on Read Print – Free books for students, teachers, and the classic enthusiast. This page was last modified on 14 November 2017, at 19:23.